After announcing the grand opening of a St. Louis Hackerspace, we received a tip that another group of our readers had an event coming up. 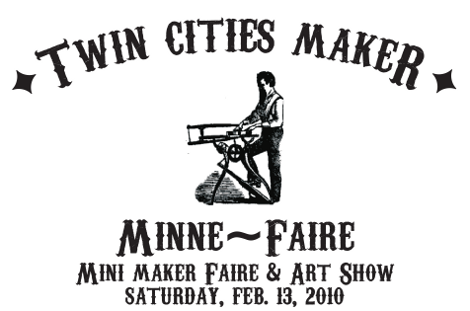 Twin City Maker of the Minneapolis/St.Paul area are hosting a Maker Faire and art show next weekend. Unfortunately, we don’t have any writers in that neck of the woods, so there wont be an official Hack a Day presence, but we are sure all of you who make it out there will do us proud. Take pictures, wont you? You must have an Arduino in your possession to gain admittance. An “honorary” Hackaday reporter should be assigned to cover this, and as a form of compensation, he/she should be given an official Hackaday T-Shirt. As a student at the University of Minnesota – Twin Cities this’ll be awesome to attend! As a Twin Cities resident, I just may have to wander over and have a gander! Dammit, i would totally show if Hackaday showed up. I dunno about Hackaday, but MAKE will be there! As the original tipster, I thank Hackaday for publicizing the event. Thanks James. I’m totally there! Too bad I have to choose between a day of beer drinking outside @ BockFest (http://www.schellsbrewery.com/newsevents_info.php?id=28) and this…. Thanks to all who came and helped make this a great day!